Notable recipes per 101 Classic Cookbook: choux rouges braises, daube de boeuf Auberge de la Madone aux cèpes et à l'orange, Gratin Dauphinois Madame Cartet, Gratin Dauphinois Madame Laracine, moules à la Provençale, gigot rôti au gratin de Monsieur Henny, poulet au vinaigre Le Petit Truc, potage aux lentilles avec saucisses de porc, roasted tomatoes Provençales, tarte au citron. Make sure vegetable mix is drained and as dry as possible before adding to couscous. Too much extra liquid will make the couscous sticky. Simple additions of herbs elevate this recipe to better-than-most split pea soups. It's now the favorite recipe for split pea soup. love this soup, as good if not better than my own. Pg. 26. One of my most favorite recipes was one for split pea soup that I got from my Mom. Because it required a ham bone and I rarely cooked ham (except for holidays), it was a rare treat. This recipe solves the problem of the ham bone by using cubed cooked ham. It's really delicious and even better the second day. I let the soup cook down to the point where the peas lose all form and this creates a smooth soup without having to use a food mill. It also serves to concentrate the flavors more intensely. I try to make this several times every winter. This is just as good as my normal split pea soup recipe from the Culinary Institute of America but much, much easier. No need to dice and sweat the vegetables, you just put everything in a pot and cook for couple of hours. I did use a stick blender to puree it for a little bit before serving. Fresh tasting split pea soup that showcases subtle herbs taste. I used ham bone from the mini carver ham from Snake River Farms and did not use the ham only. There was enough ham still attached to the bone. I also used homemade pork stock I had on hand and did not use the chicken stock. The best tasting split pea soup I've ever tasted. This soup is an old favorite that I hadn't made in a few years. I wanted to see if it held up, and it did. This soup only has a few ingredients. It is very easy to make, and it is also very good. I love recipes like this! Good, easy, healthy. I make this every winter. Pg. 39. This is delicious! I highly recommend cooking the beans yourself rather than using canned beans. I thought this salad was really delicious. I served it as a main dish salad and so I included the prosciutto, and it was very tasty too. But you could easily leave it out - just the dressing with cheese and walnuts would be great too. Needs something crunchy or crisp for textural contrast. This salad is delicious. Very easy to make, simple flavours, but not too plain. A green salad with vinaigrette. Good, but very basic. Simple but good. I used cooked chicken stomachs instead of the duck gizzards. I also added some celery leaves to the greens, which was very good. The flavors of the vegetables never really melded together well. Easy, summery, absolutely delicious. I added some Parmesan and broiled during the last 5 minutes to put a little "gratin" in my gratin. This also tastes good as a cold salad the next day. p84. I think this could be great with a few tweaks. As written, the onion still had too much bite and there was not enough sauce. More cream and longer baking (at lower temperature) next time. Did not care for this version of the dish. It was too soupy and watery. Other recipes for Roast Tomatoes Provencal that call for removing excess liquid and seeds from tomatoes first may yield better results. Use serrano or jalapeno peppers only. Do not use red pepper flakes. Have made several times, always to acclaim. Added slices/chunks of ham, sprinkled parmesan on top. Excellent comfort food. Takes a full hour to bake, plus should set a few minutes before serving. I made as written. Used the FP (2mm) for slicing the potatoes which seemed to work fine (I used russets and didn't rinse off the starch from slicing). I prepped it a few hours ahead and put it in the fridge to bake later. This caused the potatoes to exude some liquid prior to baking. Not sure that mattered. I baked it for more than an hour at 350, even then needed to crank up the oven to brown the top. And the potatoes were still on the firm side. I thought it was very good! But I am curious to try Madame Laracine's gratin next time. Also I like the idea of leaving a bit more garlic in w the potatoes. I add two cloves of chopped garlic and sprinkle it in with potatoes. My family loves this recipe! Very good. After rubbing the dish with the garlic, I chopped it up and sprinkled it on top of the potato layers with some black pepper. I sprinkled salt over the first layer, but forgot to do so for the second layer, but it did not turn out bland, I guess the cheese provided ample salt. I also used evaporated milk instead of cream or creme fraiche because I have it sitting in the fridge leftover from some other recipe. After the full assembly I also added a glug of 2% milk because my Gruyere was a little old and and somewhat dry. This is so good. I tasted the potato slices as I was assembling the gratin, they tasted great without the addition of the cheese, nutmeg, pepper and cream. By cooking the potato in the milk/water mixture with salt, minced garlic and bay leaves, they became very flavorful on their own. I made half a recipe in a 9 x 7 x 2 gratin dish, used Jarlsberg cheese because I have a big chunk that needs to be used and baked for 45 minutes. Pg. 99. This is the first recipe I've made from this book and it's a winner. This is really, really good! And quite easy. It did not take a full hour to cook, closer to 45-50 minutes. Happily, there are leftovers for tomorrow! This recipe is lighter than some gratin recipes because there is less cream in it. This was strange and not in a good way. It was basically melted cheese on top of boiled potatoes with cumin seeds. It just didn't taste very good. This was pretty rich simply from the poultry fat (I used schmaltz). I had pretty thinly sliced potatoes so they took less time to brown. They also tended to stick to the pan but using a thin spatula to turn them helped a lot. They did end up cooking into a single potato cake. The garlic sprinkled on top really adds something nice. Potatoes, onions and butter, what's not to like. It was good, but not as good as the version I used to get at the Blue Bell Inn in Blue Bell, Pa. years ago, I'm sure their version used a lot more butter as it was much crispier. I used Yukon gold potatoes, steamed them and smashed them in the pan with the onions. Highly recommended for anyone needing comfort food. Easy to make, a bit heavy on butter if you're into healthy eating but the amount can be cut down. Not quite so tasty but still acceptable. I had some pastry made which I had frozen and wanted to use it. This tart was easy and delicious. I used local ham off the bone and parmgiano cheese. A great mid week dinner with a simple grren salad. This forms a very thing layer of tart filling over a very thin crust. It's almost pizza-like. The flavor was good but the Swiss chard was a bit too earthy. Dipping it in aioli worked very well. The tomato sauce is similar to a fresh tomato salsa. The acidity in the tomatoes really complements the richness of the tuna very well. I modified the sauce to use up my cherry tomatoes, and I cut the olive oil, lemon juice and garlic in half. I thought it was quite good and went well with the tuna and a side of farro. Simple and delicious. I did not bother peeling the tomatoes. From LLM: I love this recipe. it is my favorite from the book. However, I do make some changes. I just use fillets instead of whole fish. I lightly flour them then pan fry. I also sub butter for the olive oil in the sauce - butter, capers, cumin seeds (I leave out the red peppers). I made it as written (except with fillets) the first time, and have gradually adjusted it to my tastes, but that mixture of capers and cumin seeds is really fantastic. You just pour the sauce onto the pan-fried fish. Lovely. Pg. 149. We were not crazy about the cider vinegar butter sauce -- it didn't really add that much to the fish and considering how much butter went into a very small quantity of sauce, it was ridiculous. The method for cooking the fish was very nice -- really simple and quick. I'd be happy to cook turbot or any other flat fish like this again -- but I'd find a tastier and less caloric sauce to serve with it. nice, though the peppers cook down to practically nothing, so the sauce is soupy, though delicious. I would almost think of adding some peppers a bit later to keep their texture. A nice change from the usual chicken recipes; something to make occasionally. I expected to love this but it was only ok for me. The vinegar was a bit too dominant/astringent for my taste. Not sure if a better vinegar would have improved it, and I also didn't reduce it enough. I also used blsl thighs but would have preferred a whole cut-up chicken. i would not bother to make this again. The custard never setup for me, even after baking longer than specified. The flavor was fine but I think I'd prefer a pastry cream. I absolutely loved this and most of my guests did too, but some did not. It's not really a dessert, it's more of an afternoon snack for teatime. I think if I hadn't tried to serve it for dessert everyone would have loved it. The dressing for the potato salad is very similar to a classic French vinaigrette. This...is ALL substance and no style. No matter, though. Some of my favorite comfort dishes come from this book – nothing like sausages and potatoes cooked in fat to take the edge off on a cold day. It's quite good – but also quite different from most versions of French onion soup that I’ve had. It's much lighter – none of that heavy, beefy, salty taste. Do I mind doing without it? Not at all. ...the main dish was heaven itself. Thin strips of salty prosciutto danced with the tang of lemon zest....It was moist and pungent and full of unexpected textures and tastes. It was divine. IACP and Beard Award! 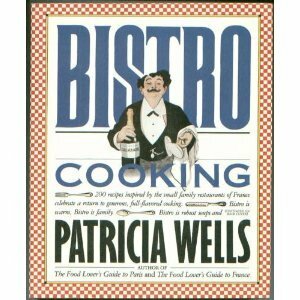 Chosen Cookbook of the Year (1989) by USA Today and selected as an Editor's Choice for the year's top books by Publishers Weekly, Patricia Wells's Bistro Cooking celebrates the return to warm, generous cuisine. Here are over 200 recipes inspired by the neighborhood restaurants of France--adapted and tested for the American table. 2-color photos and illustrations throughout.